Aviation professionals understand the need for precise language. Aviation has more unique terms than just about any other profession! Digital marketing also has a specialized language. 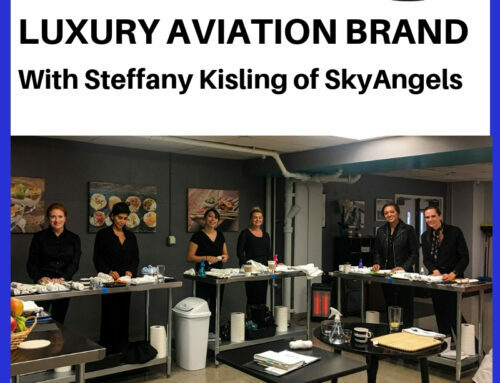 Unfortunately, this can lead to misunderstandings, and even to unfortunate situations where aviation professionals purchase digital marketing services from slick service providers who don’t take the time to be understood, and both parties end up frustrated and disappointed with the results. 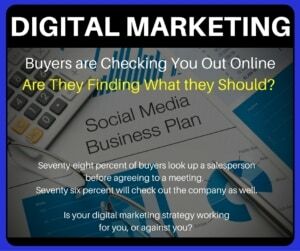 This is sad because aviation sales marketing professionals stand to gain a lot from intelligent use of digital marketing! In our practice, not a month goes by when someone tells us about being “taken for a ride” by a fast-talking digital marketing salesperson. This sort of thing is bad for everyone – it gives marketing companies a bad name, and causes aviation companies to waste valuable resource on services that aren’t right for them or don’t provide the results they expect. This glossary isn’t intended to make anyone a “native speaker” of digital marketing terminology, but hopefully we can prevent some unfortunate misunderstandings. 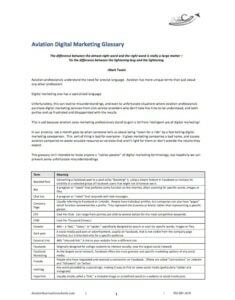 Click here to download the printable digital marketing glossary. ‘tis the difference between the lightening-bug and the lightening. Boosted Post Converting a Facebook post to a paid ad by “boosting” it, using a simple feature in Facebook to increase its visibility to a selected group of Facebook users that might not otherwise see it. A program or “robot” that performs some function on the Internet, often scanning for specific words, images or files. Chat bot A program or “robot” that responds with text messages. Company Page Usually referring to Facebook or LinkedIn. People have individual profiles, but companies can also have “pages” which function somewhat like a profile. They represent the business or brand, rather than representing a specific person. CPC Cost Per Click. Can range from pennies per click to several dollars for the most competitive keywords. Crawler AKA – a “bot,” “robot,” or “spider,” specifically designed to search or scan for specific words, images or files. Dark post A social media paid post or advertisement, usually on Facebook, that is not visible from the company page timeline, but is intended only for a specific audience. External Link AKA “inbound link.” A link to your website from a different site. Facebook Originally designed for college students to interact socially, now the largest social network. Facebook Marketing As the largest social network, Facebook offers the most granular and specific marketing options of any social media. Friends People who have requested and received a connection on Facebook. (These are called “connections” on LinkedIn and “followers” on Twitter. Hyperlink Usually simply called a “link,” a clickable image or underlined word on a website or social media post. IM Instant messaging or online chat. Image Tag Words identifying an image. Usually not seen on the website but placed in the underlying code to help search engines and bots identify and index images. Impression Each time an ad is viewed in a browser on any device – desktop, tablet or phone. Note – it doesn’t necessarily have to be clicked or acted upon to count as an impression. Inbound Link AKA “External Link.” A link to your website from a different site. Inbound Marketing A strategy that focuses on attracting customers via company-related internet content and acquiring their contact information in exchange for high-value information. Instant Messaging A type of online chat – real-time text messages transmitted over the Internet. Keyword Density The number of times a keyword appears in a post. Keywords Words or phrases that capture the essence of a topic or document, used by search engines (Google, Yahoo, etc.) to find the most relevant material to people searching. Landing Page A page intended to be the first one viewed on a website. Could be the home page, but usually built for a specific purpose. Lead Magnet A mechanism on a website or social media encouraging people to subscribe to future updates (or marketing) in exchange for high-value information, such as a buyer’s guide or tip sheet. Link AKA “hyperlink,” a clickable image or underlined word on a website or social media post. Link Farm A site built specifically for the purpose of creating external links to boost search engine results for client sites. Often created as a directory or low-quality blog with many gratuitous links. LinkedIn Marketing Using the LinkedIn social media platform for marketing, either by searching for prospects based on specific criteria or by publishing paid ads to specific individuals. LinkedIn Articles Longer and more complex that LinkedIn Updates, the Articles function allows for a complex blog hosted on the LinkedIn social media platform. LinkedIn Updates Short, simple social media updates on the LinkedIn platform. MeetEdgar A social media posting and aggregating tool. Messenger marketing Using chat, IM or Facebook Messenger for marketing purposes, usually by broadcasting text messages and responding to text messages using a bot or computer program. Meta tags Meta tags are words and phrases attached to an item on the web, such as a web page or image (see “image tags”) to help search engines and other bots to scan and index the material. Organic Listings Search engine results that are not paid ads. Organic Results See organic listings. Unpaid search engine results. Outbound Marketing Reaching out to prospects with direct mail, telephone, connecting on social media, usually unsolicited. Paid Ad An ad on any social media or search engine that has been paid for. Paid Listing A listing in any directory that was paid for. Pay Per Click Terms of sale of an online advertisement that include an agreement to pay a specific amount each time a link or image is clicked, presumably bringing visitors to your own website or product page. Personal Page AKA “Profile” on a social media channel. Personal pages with a minimum of information are required to log into Facebook and LinkedIn, where permissions are based on your personal account. Podcast Audio (or video) files, usually on a specific topic, usually a series with a subscription, hosted by iTunes, Stitcher, or Google Play. Popular aviation podcasts are hosted by Aviation Week, The Airplane Geeks, and others. Profile AKA “Personal Page” on a social media channel. Personal pages with a minimum of information are required to log into Facebook and LinkedIn, where permissions are based on your personal account. Rankings Where your site or page appears in the search results, AKA “search results” aka “search page” aka “SERP.” The first five spaces or the first page of results is the most coveted because most Internet searchers usually don’t search past the first page of results. Redirect Code that causes a visitor to find himself on a different web page. Often used as a shortcut for convenience or marketing. For example, if you type in ABCI1.com you will be redirected to AviationBusinessConsultants.com. 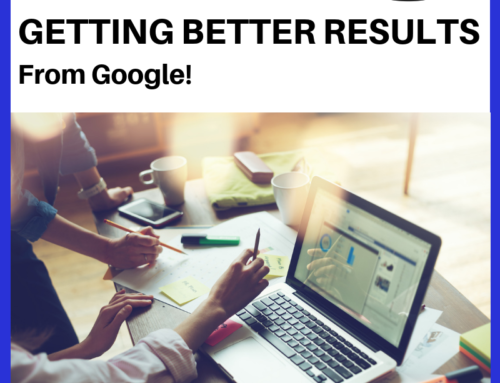 Results Page AKA “search results” aka “search page” aka “SERP.” The page that appears after you type a specific keyword or phrase into a search engine. The first five spaces or the first page of results is the most coveted because most Internet searchers usually don’t search past the first page of results. Robot A program or “bot” that performs some function on the Internet, often scanning for specific words, images or files. SEM Search engine marketing. Techniques used to make your content show up more prominently in search results. Includes paid search options like Pay Per Click ads, optimizing content for better organic search results, (SEO) and adding more content to attract the attention of the search engines. SEO Search Engine Optimization. Visible and invisible changes made to a website, web pages, images, and other parts of a website to make it easier for the search engines to find and index. This helps visitors using search engines to find your website more easily. SEO Audit An evaluation of your website to find ways to make it perform better search engines. The starting point of any good Search Engine Optimization program. SERP Search Engine Results Page. The page that pops up when people search for a particular keyword. Sitemap An outline of the pages on your website, designed to help people or (more often) search engines find their way around your site. An XML sitemap is built in a programming language and is intended for search engines. SlideShare Owned by LinkedIn, a social media network designed to help people share and find slide presentations on specific topics. Can be used to explain topics or even sell products. Social Media Any website or app that helps people interact with one another. The most popular social media networks for aviation industry professionals are LinkedIn, Facebook, Twitte Slideshare and a few others. Spider AKA – a “bot,” “robot,” or “crawler,” specifically designed to search or scan for specific words, images or files. Subscribe A key component of inbound marketing. When a person “friends,” “likes” or “follows” you on a social media platform, they are essentially subscribing to see updates from you in the future. You can also set up “lead magnets” on your website inviting visitors to subscribe, usually in exchange for some high-value information they want. Tweet A post or update on Twitter. Tweetup A meeting where people who are connected on social media (usually Twitter) meet. There are often Tweetups for social media connections at major aviation conventions. Twitter Marketing Posts on Twitter designed to advertise a product or service. Social media is almost entirely composed of UGC. Usability Audit An audit of your website based on industry-standard practices. For example, most people look for a search or shopping cart function in the upper right corner, and most people look for underlined links. A Usability Audit evaluates how well the website conforms to these conventions. 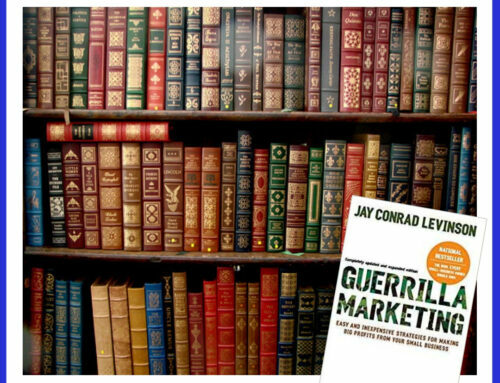 Viral Marketing Content created with the intention of being shared on social media. “Viral” is meant to describe how a virus moves from one organism to another. But in digital marketing, the “virality” of a post is based on how many people share it with their own social networks. Web 2.0 Web 2.0 does not refer to an update to any technical specification, but to changes in the way Web pages are designed and used. A Web 2.0 website may allow users to interact and collaborate with each other in a social media dialogue as creators of user-generated content in a virtual community, in contrast to the first generation of Web 1.0-era websites where people were limited to the passive viewing of content. Examples of Web 2.0 features include social networking sites and social media sites (e.g., Facebook), blogs, wikis, folksonomies (“tagging” keywords on websites and links), video sharing sites (e.g., YouTube), hosted services, Web applications (“apps”), collaborative consumption platforms, and mashup applications. Web Conference AKA “Webinar” – A seminar delivered over the Internet, so that participants can hear audio and see video or slides, and usually participate by asking questions via a chat function. Webinar AKA “Web Conference” – A seminar delivered over the Internet, so that participants can hear audio and see video or slides, and usually participate by asking questions via a chat function. Website Audit Website Audits can be based on Search Engine Optimization (to improve the number of visitors) or Usability (to help turn those visitors into customers, clients, passengers, etc. The intention is to improve the marketing performance of a website. Wiki A website that allows collaborative editing of its content by users. Wikipedia The world’s largest wiki, an online user-generated encyclopedia. People and things can be submitted for inclusion into Wikipedia and are confirmed by a board of volunteer editors who enforce a set of guidelines. It can be a great marketing strategy to create a Wikipedia entry. XMP Sitemap AKA “sitemap.” An outline of the pages on your website, designed to help search engines find their way around your site. YouTube A social media platform where participants view or submit videos. 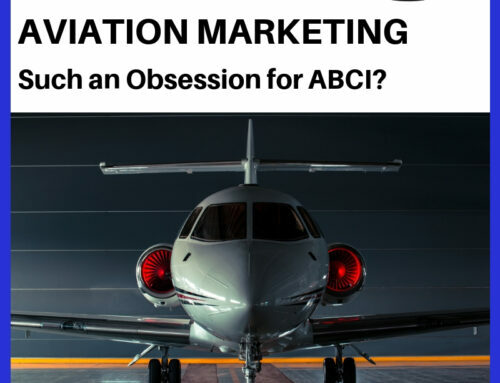 Did you know . . .ABCI offers Digital Marketing for Aviation companies? Aviation Digital Marketing – Please Enjoy Responsibly! 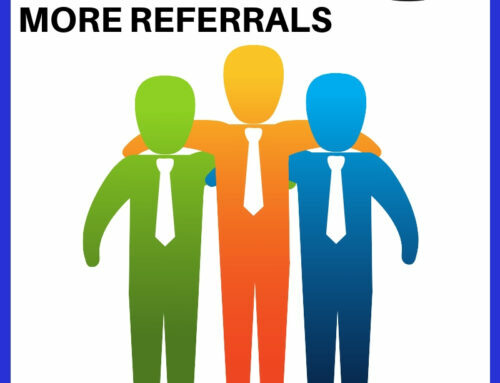 A Quick Tip for Getting More Online Reviews!